Early starts on these Queensland winter mornings have certainly separated interested bird watchers from avid twitchers and for those that have braved the early starts, we've certainly spotted some great specimens in and around the wallum scrub and resort grounds. With the sun slow to rise over the grounds at the moment, the first call of the day has become a contest between the Eastern Yellow Robin and the Laughing Kookaburra. In the end, the Kookaburra certainly played true to its nickname as the 'Dawn Breaker' and was often heard above all others. The Honeyeaters - White-cheeked Honeyeaters, Lewins Honeyeaters and Scarlet Honeyeaters were quick to add to the morning chorus once they warmed up. Above average rainfall on Fraser Island over the past month has seen an increase in new grass shoots around the resort and a welcome return to our smaller feathered locals - the Red-browed Finches and Red-backed Fairy Wren - with both species delighting in the warm winter sun and abundance of food. The beach truly came to life in July and early August with several bird walks occurring in the typical westerly weather - perfect for local birds of prey. 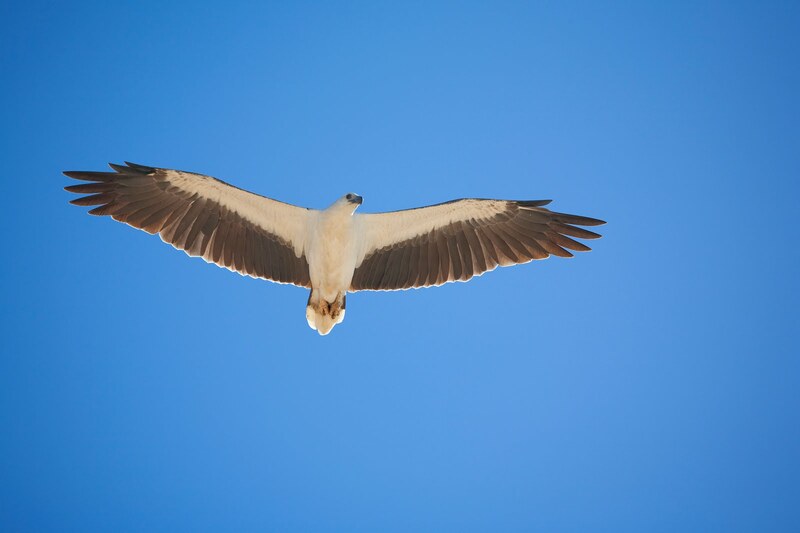 Whistling Kites, Brahminy Kites, Osprey and the occasional White-bellied Sea Eagle (see pic) made appearances showing their prowess in the skies over the Great Sandy Strait. 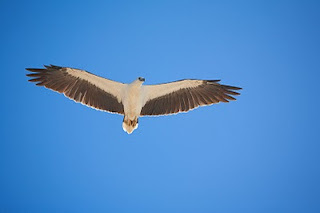 A few morning we watched a Brahminy and a Whistling Kite jostle for prime nesting locations - the Whistling Kite winning out more times than not. Am sure our twitchers, early morning risers and folks just new to birding will agree it's been a great time to photograph, view and chat about feathered friends on beautiful Fraser. Until next time, Ranger Bec. Ranger Bec here, just touching base after a small break from blogging to say g'day to all you tree-huggers out there. Despite some chilly nights throughout the last month or so, our friendly locals have been making some regular appearances around the resort grounds during our nightly spotlighting walks. The local Sugar and Squirrel Gliders have been seen performing consistently throughout the treetops - making full use of their gliding ability much to the delight of resort guests. By gliding between the canopies of surrounding forests, these cute critters ensure they keep away from the predators below. It's also a much more efficient use of their energy. Even their smaller relative the Feathertail Glider has made the odd cameo appearance since we last blogged - showing that, despite their small size, they can still be extremely acrobatic when moving about the canopy in search of food. The main road to the resort came to life throughout July when members of our resident Microbat colony ducked and weaved in the night sky chasing insects. Not only do Microbats have the ability to detect their prey through the use of sonar, they also detect the size of their prey, the direction they are flying in and how fast they're flying - valuable information to ensure they never miss a meal! The marine environment has also served up a treat for onlookers with several winter Whiting, Flathead, Garfish, Hardiheads and Herring spotted in the waters below our famous jetty. Regular sightings of a Green Sea Turtle around the ferry ramp also kept guests entertained in the evenings. Fraser Island's clear winter skies have provided some great viewing for budding astrologers and astronomers - we've seen everything from the Southern Cross to the entire Milky Way. We were even lucky enough to spot Mars, Venus, Saturn and Mercury all on a single night. July and early August bought about many fantastic sightings of the local wildlife here at Kingfisher Bay... and we eagerly await what's in store over the next month. Until next time, Ranger Bec.